A victory by Marshall (8-3) would end the Hokies’ nation’s-best 25-year bowl streak, and leave one more spot open for other teams seeking the best postseason destination available. But Virginia Tech (5-6) has other plans. The Hokies agreed to pay the Thundering Herd to come to Lane Stadium before their 34-31 overtime victory against Virginia on Friday, a win that bumped their streak of consecutive victories over the Cavaliers to 15. The Thundering Herd would’ve received $100,000 for its willingness to play the what-if game if Saturday’s game had been canceled. Making the negotiation pay off after the emotional victory against Virginia won’t be easy. The Hokies are young on defense and have, at times, had trouble stopping the run, but Holliday has faced a Bud Foster-led defense before and is confident that’s what the Hokies will try to do from the outset. The Hokies’ victory against Virginia was emotional, and somewhat unexpected until a few bounces went their way late, and those kinds of games can be hard to put in the rearview mirror in a week’s time. How Fuente, Foster and the coaching staff impress on their players the importance of extending the bowl streak will be critical. Marshall’s special teams have contributed heavily in wins the past two weeks. Brandon Drayton recovered a blocked punt in the end zone and Marshall also blocked a field goal in a 28-25 win at FIU last Saturday. In a 23-0 win over UTSA the week before, Marshall recovered a fumble on a kickoff and scored a touchdown on the next play. Senior Tyre Brady is coming on strong at season’s end as the go-to receiver in Marshall’s offense. Brady has three TD grabs in his last two games after getting none in the three contests before that. For the season he has nine TD catches and 890 receiving yards as he tries to become the school’s first 1,000-yard receiver since 2014. The Hokies are 10-2 against Marshall and won the last meeting, 29-21, in triple-overtime in 2013. 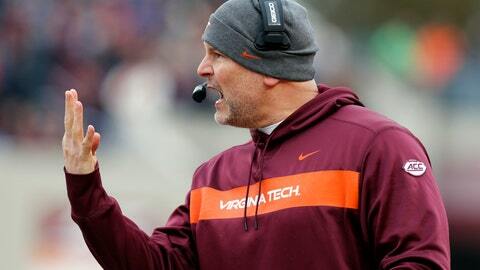 … Hokies coach Justin Fuente is 0-1 against the Thundering Herd. His Memphis team lost 38-28 in 2012. … Marshall is one of four teams nationally that has not allowed a 100-yard rusher this season. … The Thundering Herd has outscored its opponents 74-22 in the first quarter. Virginia Tech has been outscored 77-3 in its last five third quarters at home.